Be astounded by the grace of superior technology. Nonmagnetic SS Frame with greater heat resistance - The power of stainless steel adds matchless durability to this gas stove. Euro coated sturdy Pan Supports – This special feature prevents the pan of the gas stove from chipping off and provides splendid care. Higher ground clearance – Cleaning the gas stove is no longer a hazard. High ground clearance of this model provides adequate space for cleaning. 0.7 cm (7 mm) thermally toughened superior grade glass top – This feature helps in increasing the strength of this product. Removable SS Drip Trays with corrosion resistance – Worried about the life of your gas stove? Worry no more. This high-end feature assures more life to this special product. Free Mini Pan Support and burner cleaning pin – Specially designed to withstand harsh conditions, the Mini Pan Support provides sturdiness to your product. 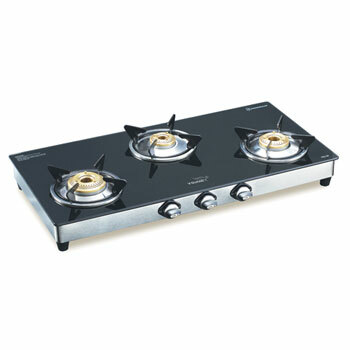 Also the Burner Cleaning Pin helps to keep the product clean and hygienic.